I apologize for sending still another e-mail, but Fitchburg Environmental Engineer Rick Eilertson just sent me a change of schedule for the waterway bike ride as well as additional information about several events. Brush hauling and clean up dates and times are the same as published before in the Dunn’s Marsh Neighborhood e-News. Here’s Rick’s e-mail about the events. The changed information is in red. Unfortunately, I was not able to open any of the links. I hope this was just a temporary server problem, not a problem with the links. I’ve attached the map Rick had given me a few weeks ago for the May 1 waterway cleanup. The meeting place for “Group 1” is where the April 24 group will also meet. Happy 1 Day After Earth Day 40! Below is an updated short summary of numerous upcoming activities sponsored by Fitchburg related to a celebration of the 40th Anniversary of Earth Day. Please note that the *(Starred) Events have updated information from the last e-blast I sent. In particular, the April 24th Nine Springs Creek Watershed Biking Tour has been rescheduled for May 1st due to anticipated thunderstorms tomorrow afternoon. Please add these items to your calendars (both hard copy and electronic) and pass them along to any others who would be interested. *Sat., April 24, 2010 - 8am to 11am - Electronics Recycling and Shred Day Events - map and further details can be viewed at: http://www.city.fitchburg.wi.us/documents/Spring2010E-cyclingnShredDayEvents.pdf Please note: Surplus-IT is now offering $5 off and $15 coupons for certain electronic items on page 2 of the brochure. Many of the electronics are FREE to drop off for recycling. *Thurs., April 29, 2010 - 5:30pm to 8pm - Fitchburg Green Expo at Promega's BTC - 5445 E. Cheryl Parkway - map and details available at http://www.city.fitchburg.wi.us/documents/GreenExpoWebsiteFlier.pdf The expo will include a program with several distinguished speakers, which starts at 6:30 p.m., as well as time to visit with local exhibitors before and after the program. Refreshments will be provided and door prizes will be awarded. - Contact Rick Eilertson for more details. NOTE: This is a FREE event with over $1,000 in valuable door prizes already pledged by local exhibitors and presenters ($500 Gift Certificate from Gerhard's First Supply, 4 Free Rounds of Golf at The Meadows of Sixmile Creek from 2nd Season Recycling, 1-CFL Floor Lamp from MG&E, 1-Earth Machine Compost Bin from Pellitteri Waste Systems, 1-$25 Gift Certificate for shopping at Habitat ReStore, and more). Sat., May 1, 2010 - 8:30am to 11:30am - Arbor Day/Earth Day Celebration and Spring Community Cleanup Day Event - Headquarters is at McKee Farms Park Shelter - Contact Ed Bartell at 270-4289 or ed.bartell@city.fitchburg.wi.us or Scott Endl at 270-4288 or scott.endl@city.fitchburg.wi.us for more details or to sign up. Neighborhood Clean Ups This Sat., & Next. Just a reminder that everyone is invited to Dunn’s Marsh Neighborhood cleanups this Saturday, April 24, 9 am to noon, and next Saturday, May 1, 8:30-11:30 am. This Saturday there will also be a waterway bike ride from 1:00-4:00 pm. Meet for the clean ups at the Dunn’s Marsh Conservancy on Crescent Road. This Saturday’s work will focus on hauling brush to the curb from Lots 19 and 20 and the conservancy land, but people who prefer to pick up litter instead will be accommodated: Rick Eilertson will be bringing trash bags. Rick suggests the following for the April 24 clean up if you intend to help drag brush to the curb. The Bike Tour of the 9 Springs Waterway will begin at 1:00 p.m. on Saturday, April 24, from the Dawley Park parking lot further down Seminole Highway. Rick will be leading it. Expect to travel on the Capitol City Trail as far as Fish Hatchery Road. On Saturday, May 1, gather at 8:30 am in front of the Dunn’s Marsh Conservancy sign on Crescent at 8:30 a.m. Rick will again lead this clean-up which is strictly a litter pickup. The Dunn’s Marsh Neighborhood Council meets on the third Tuesday of each month at 7 p.m. The location is Prairie Unitarian Universalist Society, corner of Crawford and Whenona. Any resident may attend although only the Council members can vote on motions. Let DMNA President Jeff Glazer know if you plan to attend at 277-1778 or <jglazer75@gmail.com>. If you have an interest in serving on the DM Neighborhood Council, please let DMNA President Jeff Glazer know. Council members are expected to attend a monthly meeting and help in some way with DMNA activities. Any applicants should also provide information that will help the Council decide whether to support them for a Council position. Jeff’s contact information is in the previous notice. Thursday, April 15, and other dates – HospiceCare seminars. See articles #21 & 22. Saturday, April 17, 12:30-3:00 p.m., DMNA Chili Fest, at New Beginnings Preschool, 2095 Red Arrow Trail, behind MacDonald’s. See article #1. Tuesday, April 20, 7:00 pm – DMNA Council meeting, Prairie UU Society, corner of Crawford & Whenona. Contact Jeff Glazer, above, if you plan to attend. Saturday, April 17, 11 a.m. Free home composting classes. Sequoya Library, 513 S. Midvale Blvd. Thursday, April 22 – Earth Day – Many activities around the Madison area. See article #14 the attachment “4 Urban Ag Tour” for a bike tour on the 22nd and an auto tour on April 23. Saturday, April 24, 9 am-Noon – Volunteer Work Party at proposed Apache Drive Wet Pond below Crescent Road near Dunn’s Marsh. Help haul brush!!! Meet at Dunn’s Marsh Conservancy sign on Crescent Rd. 1-4 p.m. - Biking Tour of Nine Springs Creek Watershed. Meet & end at Dawley Conservancy Parking Lot on Seminole Highway above Dunn’s Marsh. Contact rick.eilertson@city.fitchburg.wi.us <mailto:rick.eilertson@city.fitchburg.wi.us> to sign up. See article #2. Saturday, May 1 – 9 am-4 pm – Compost Bin & Rain Barrel Sale - Olin Avenue Parking Lot next to the Alliant Energy Center. See article #15. Saturday, May 8, 9 am-2 pm - Arboretum Native Plant Sale, near Arboretum Visitor Center, Seminole Hy. See article #16. Sunday, May 16, 10 am-2pm – Family Horticulture Day, 8502 Mineral Point Rd, Verona. See article #17. 7 - Want to Learn More About the Verona Road Issues? 12 - Great Rain Garden Links. These are all super resources. 18 - Who Won April 6? You’ve read about it for weeks and received a special announcement and, we hope, a paper copy in your door. Saturday is the time pick up your feet and get on over to the Dunn’s Marsh Neighborhood Chili Fest at New Beginnings Preschool at the corner of Red Arrow Trail and Thurston Lane behind MacDonald’s. Who’s welcome? Any resident of the Dunn’s Marsh Neighborhood. Kids are very welcome, but they should come with their parents or another adult. The neighborhood is bounded by Seminole Highway, Dunn’s Marsh, Allied/Carling Drives, Verona Road, and the Beltline. What to bring: A desire to meet and visit with your neighbors, chili or a chili condiment or a dessert, any board games you might want to play. Put on your work clothes and come on down to the Dunn’s Marsh Conservancy sign on Crescent Road on two successive Saturdays. The days are April 24 starting at 9:00 a.m. and May 1 starting at 8:30. You’ll get exercise, a chance to commune with neighbors, and the satisfaction of doing something for our neighborhood environment. Here’s Rick Eilertson’s description of the April 24 brush clean up. A map of locations of the May 1 cleanup is an attachment. I'm planning to meet with Mark Hodel (our Street Supt.) this afternoon (April 13, 1pm-2pm) and Jeff Kraemer (NRC) on Thursday afternoon (April 15, 3:30pm-5pm) to come up with a scope of work for the volunteers and will share that wthl all of you as soon as we have this finalized. Please feel free to provide any feedback you think would be beneficial. Due to the resignation of a member of the Dunn’s Marsh Neighborhood Council, there’s an opening for a replacement to fill out the 12-member body. Our bylaws provide for the vacancy to be filled from residents who may apply from any part of the neighborhood. The chosen person will serve until the annual meeting of the DMNA, in September or October 2010. If you are interested in joining a group of neighbors who are working to improve our neighborhood, please contact DMNA President Jeff Glazer or anyone else on the Council. Provide your name, contact information, and any other information that you think would help the Council decide on whether to appoint you. A formal resume is not necessary, but it would be helpful to know something about you personally and your particular interests and goals for wanting to serve on the Council. The Council generally meets on the third Tuesday of the month from 7:00-9:00 p.m., at Prairie UU Society, corner of Crawford and Whenona. 1. Attend meetings of the Neighborhood Council and provide a reason if unable to attend a particular meeting. 2. Help with DMNA work such as distributing newsletters, joining a committee or neighborhood interest group, contacting officials, and/or attending hearings. 3. Be willing to have name, phone and/or e-mail address published in neighborhood communications and websites. 4. Adhere to the bylaws of the DMNA. Upon a finding by the Council that a Council member has flagrantly violated the bylaws, the Council may vote to dismiss the member from the Council and from membership in the DMNA for the remainder of the term. As of Friday, April 9, we have a new restaurant in the neighborhood. It is Faouzi’s Restaurant, located on the Frontage Road at 4245 West Beltline Highway (the old Blarney Stone). It is strictly a restaurant with no alcohol sold or served. The menu is quite varied with several ethnic cuisines represented. The servings are large and the hours are long, usually from 6:30 am until late at night. The building has been remodeled with large windows, carpeting, and new handicap accessible restrooms. Booths and tables are a dark wood. Since the operators of Faouzi’s Restaurant are Moroccan, it is not surprising that some of their offerings come from that part of the Mediterranean. You can try Moroccan Tagine, Moroccan Couscous, Kababs, or a Moroccan side salad. Moroccan bread comes with the meal. But you can also order Nachos or Chicken Quesadilla, Cajun Chicken, a Reuben Melt, Buffalo Wings or Onion Rings, a California or Texas Burger, Thai Red Lobster Curry, Beef Prime Rib or Filet Mignon and many other appetizers, sandwiches, salads, and entrees. Just as an example of prices, the large Moroccan Side salad is $2.50, Onion Rings or Mozzarella Sticks are $3.99, Nachos or Eggplant or Zucchini are $4.99, burgers run from $5.50 to $6.50 and come with fries and a big dill pickle. Salads run $6.50 to $7.99, and entrees are $8.99 to $15.99. As the first customers on Friday night, two of us sampled the Kababs, Moroccan Side Salad, and the Cajun Chicken. We also had sodas, an absolutely delicious soup, and Moroccan Bread. The bill came to $18, but with the amount we took home for another meal or two, we felt $25 including taxes and tip was not too much to pay. Monday – 6:30 a.m. – 10 p.m.
Tuesday & Wednesday – 6:00 a.m. – 11:00 p.m.
Thursday – 6:00 a.m. – 11:30 p.m.
Sunday – 6:30 a.m. – 11:00 p.m.
A recent development in the struggle against the Verona Road/Beltline reconstruction project is the establishment of a Google group called the Verona Road Justice Coalition. The purpose of the group, as stated on the website “is to provide an organizational structure to enable individuals and organizations to discuss, research, mobilize, organize and share their concerns and responses to the WisDOT proposed Verona Road/US 151 construction project.” Access this group at http://groups.google.com/group/verona-road-justice-coalition. It is a potent website with facts on presentations about the reconstruction, health effects of noise and air pollution, sample letters and a list of addresses (e-mails too) to send them to, and much, much more. Many thanks to Crawford resident Connie Roderick who has set up the Google group and posted much of the content. Dozens of letters have been signed opposing the Verona Road /Beltline reconstruction project. Neighborhood advocates continue to mobilize the neighborhood. The goal is to moderate or even prevent the widening of the highways and the resulting impacts on the frontage roads and to residents of the neighborhood. What’s been initiated so far? Regular meetings of the committee working against the reconstruction. Meetings between individual residents and the highway planners. An informational meeting in the neighborhood on the subject of air pollution. A hotdog grilling/letter signing event. The establishment of the Verona Road Justice Coalition Google Group (above). A good showing of neighborhood residents at the most recent PAC/TAC meeting at Strand Associates. A presentation to the Thoreau PTO. The April 7 meeting of the PAC/TAC (Policy Advisory Committee/Technical Advisory Committee) brought out at least 9 neighborhood residents and 3 elected officials who represent our area. The meeting was called by the Wisconsin Department of Transportation to review the study history and talk about current status of the plans. Neighborhood residents attending included Fitchburg Alder Carol Poole, DMNA President Jeff Glazer, other DMNA Council members Kim Zinski, Donna Sarafin, Jo Kelley, and Mary Mullen, and residents Connie Roderick, Dorothy Krause, and Mike Marty. County Supervisor Matt Veldran and State Representative Therese Berceau also sat in on the meeting. Dunn’s Marsh Neighborhood residents were happy that they were able to raise questions at the meeting, since that possibility was not assured beforehand. But the project has a big head of steam, and this meeting did nothing to derail the basic plan. If you haven’t kept up on the Verona Road/Beltline project, here’s a list of some of the features of the plans for Stage 1, set to begin in 2013 with construction going on for 2 ½ years!!! connecting the Verona Road end of Carling Drive to Allied Drive. 1. Access the Verona Road Justice Coalition Google group at at http://groups.google.com/group/verona-road-justice-coalition. See the slide show that was shown to the PAC/TAC committees on April 7. 2. Check out the Wisconsin Department of Transportation webpage on this project. 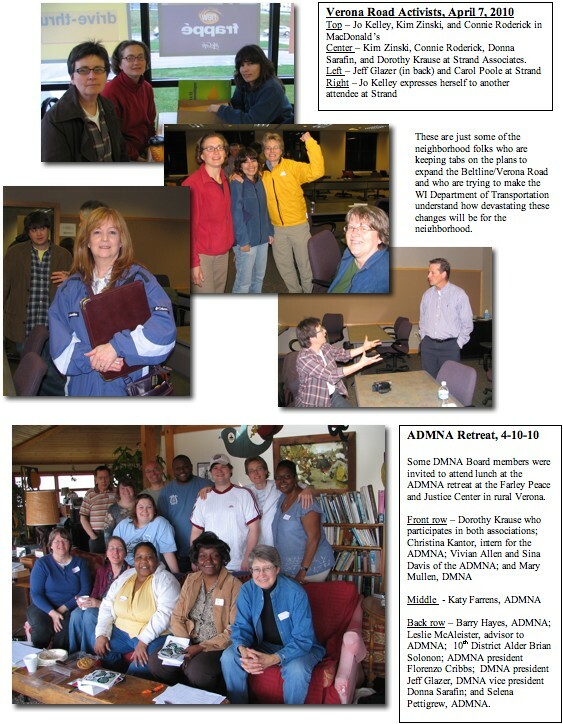 Go to http://www.dot.wisconsin.gov/projects/d1/verona/public.htm. Under the second headline, Public Information Meetings (PIM), look at Past Meetings. The PowerPoint presentation made by DOT and Strand Associates on March 4 is available for viewing and printing. Special maps are available too. Look at the sidebar and click on Maps. Scroll down to 3 stage solution alternative (March 10, 2010). 3. The DMNA has a nice set of large maps here in the neighborhood that will go a long way toward showing the plans. Contact DMNA Communications person Mary Mullen (See masthead.). 4. You can join the neighborhood coalition committee. Contact DMNA Council member Jo Kelley, 276-8010, 445-5981 or jokelley@tds.net. Signs are in the news both for the Allied area of the neighborhood and for the neighborhood as a whole. It took about 6 years to get the Allied neighborhood sign in the ground at the head of Allied Drive, so imagine the sorrow and consternation of the Allied-Dunn’s Marsh Neighborhood Association to find it vandalized just a few days after it went up this spring. The vandalism was the work of a gang that appears to be operating in the area. This gang has tagged other spots in the neighborhood with its C-14 graffiti and is on the watch list for the police. In other sign news, on April 3 the Dunn’s Marsh Neighborhood Association’s sign subcommittee did a bike tour of possible locations for the Dunn’s Marsh Neighborhood sign that has been funded by the City of Madison to the tune of $4,750. The committee’s first choice is Seminole Highway at the Frontage Road. This is a high volume intersection for vehicles, bikers, bus riders and even pedestrians. A sign here would notify people both within and outside of our neighborhood of the name of the neighborhood. The private landowner who has the property on the market would have to agree to having the sign located there. It must be 20 feet behind the curb on both sides. Second choice for the Dunn’s Marsh sign is the entrance to the neighborhood from Verona Road. The location in the green space where the big cottonwood tree stands was surprisingly visible. However, if/when the Verona Road reconstruction takes place in 2013, this intersection would be so changed that the sign would be useless and probably not even feasible at that location because of the extra lane on Verona Road and the underpass to take neighborhood traffic across Verona. The sign would then have to be moved to a different location. The third choice for the sign was down Seminole Highway at the former railroad track intersection. That railroad right of way will soon be devoted to the Cannonball Trail. The committee had to reject that site because Madison won’t fund a sign to be located in the City of Fitchburg. A substitute location could be on the east side of Seminole, but right of way is very narrow, the sign wouldn’t be at the corner of the neighborhood, and it would be seem out of place on the undeveloped Arboretum side of the road. This location would also be substandard because far fewer people would see it. Check out the attachment to see the 2 favored locations and the subcommittee who made the rounds of the possible sites. Neighbor Kristen Durst, a resident of the Crawford area and one of the voices on Wisconsin Public Radio, fell while rollerblading on Friday evening and broke her leg. She’s recovering at University Hospital. Our condolences go out to Kristen along with wishes for uncomplicated healing. (False) rumor had it that the land below Crescent Road was being cleared for development of apartments or condos. It didn’t help a bit that Fitchburg police were one source of this false information. Readers of this e-News should be in the know. The land below Crescent at Apache Drive has been cleared so that Fitchburg can build a wet pond there. The pond is being built to trap sediment that arrives in the stormwater from the neighborhood. Spread the truth. No apartments! No condos! Instead, it’s a pond that should improve the quality of water going into Dunn’s Marsh. The organization Plant Dane! has a cost-share program for putting in rain gardens that is open to individual residents, schools, non-profit organizations, and municipalities in Dane County, Wisconsin. Applications are still being accepted, but should be put in soon so that plant orders can be made before May 15 according to Marcia Hartwig, Madison Area Municipal Storm Water Partnership Education Coordinator. A rain garden is a low area that you create in your yard and to which you direct water run-off from your house or paved areas. Planting it with native plants that do well in wet areas means that the water is soon sucked up by the plants. The rain garden keeps water from getting into the streets and into the streams, ponds, and lakes. This is important because with all the paved areas in urban areas, too much water comes into them too fast along with every possible pollutant the water picks up on its way there. You can see examples of rain gardens in Marlborough Park near the basketball court and in the front yard of 4333 Crawford Drive. Through a gift from the Graham-Martin Foundation* (GMF), the Plant Dane! Program provides native plants at the greatly reduced price of $1.80 each—less than half the normal retail price. Interested individuals complete an online application at <http://www.myfairlakes.com/applicationForm.aspx> Then the coordinator will send you a plant order form by mail. Orders with payment must be received by May 15, 2010. Plants will be delivered to One Fen Oak Court <http://www.danewaters.com/location.aspx> , Madison, WI on June 26, 2010, 8 am-9:30am. Participants must pick up plants on this date, or have a friend, neighbor or relative pick up plants for them. Preselected plants mixes will be also available on a first-come, first-served basis on the day of delivery. Contact Marcia Hartwig, Madison Area Municipal Storm Water Partnership Education Coordinator at (608) 224-3746 or email hartwig@co.dane.wi.us <mailto:hartwig@co.dane.wi.us> , for more information. * The Graham-Martin Foundation, Inc., is a registered 501(c)(3) organization, dedicated to the preservation and restoration of natural ecosystems and the promotion of environmental education. eligible for rebate must be a HET (which use an average of 1.28 gallons per flush) and must be on the EPA WaterSense list. Any toilet that meets the criteria and is purchased after January 1, 2010, will be eligible. Rebates will be in the form of checks sent to the property owner of record; the check amount will not exceed the purchase price of the toilet. Click here <http://www.city.fitchburg.wi.us/public_works/documents/ToiletRebateApplication.pdf> for program information. Earth Day was started by a Wisconsinite Gaylord Nelson some 40 years ago and it is still going strong. One way to celebrate it is to participate in the 2010 Urban Ag Tour. Check out the attached flyer. Newspapers will tell you of numerous other opportunities. The City of Madison and Dane County are again offering compost bin and supplies for sale, as well as rain barrels from SustainDane! The sale will be Saturday, May 1, 9am-4pm (or until supplies last) at the Olin Avenue Parking Lot next to the Alliant Energy Center. The bins will be sold on a first come first served basis while supplies last. You do not have to be a Madison or Dane County resident to buy a bin. No limit, purchase as many bins as you need. The 2010 Native Plant Sale takes place on May 8 from 9 a.m. to 2 p.m. in the large tents next to the Arboretum Visitor Center. Get there from the entrance to the Arboretum on Seminole Highway, south of the Beltline. We'll have native grasses; woodland, prairie and savanna plants; trees and shrubs. Check out our year-round garden tools and related merchandise here <http://uwarboretum.org/foa/foa_gift_shop/index.php> . Horticulture will be a Technicolor experience at Family Horticulture Day at the University of Wisconsin West Madison Agricultural Research Station, 8502 Mineral Point Rd., Verona, WI, from 10 am-2 pm Sunday, May 16. This location is a bit west of the Beltline on Mineral Point Road. Purple, red, and yellow potatoes, red popcorn and green caterpillars will be the features of the day. Families can learn how to develop a back yard kitchen garden in a small space: tomatoes, peppers, broccoli, and eggplant seedlings will be provided, along with instructions for growing them and directions for sowing vegetable and flower seeds will be available from master gardeners. In case you didn’t follow the results of the April 6 election, these are results pertinent to our area. Dane County District Attorney Brian Blanchard defeated Richland County Circuit Judge Edward Leineweber for a seat on the District 4 Court of Appeals <http://www.nbc15.com/home/headlines/90057707.html> in Wisconsin. The 24-county district includes the southern and central Wisconsin counties of Adams, Clark, Columbia, Crawford, Dane, Dodge, Grant, Green, Iowa, Jackson, Jefferson, Juneau, La Crosse, Lafayette, Marquette, Monroe, Portage, Richland, Rock, Sauk, Vernon, Waupaca, Waushara and Wood. For County Board, Matt Veldran, who represents the Belmar area of our neighborhood, was reelected. Co. Supervisor Carousel Andrea Bayrd, who represents the Madison portion of the neighborhood, ran unopposed. For Madison School Board, James Howard won over Tom Farley. Finding it hard to get out to go grocery shopping? The Fresh Madison Market is offering free deliveries anywhere in the Madison city limits with a $40 order, not including tobacco or alcohol. Order online at www.freshmadisonmarket.com <http://www.freshmadisonmarket.com> . You can also order by phone, tollfree, at 877-933-3033. Pay for your groceries online or by check. You can order up to 7 days in advance as well as the same day for delivery. Delivery is available every day from 9 am to 9 pm. The Friends of Fitchburg Library and the Fitchburg Public Library are hosting an author event on April 15 at 7:00 in the Fitchburg Room of the Fitchburg Community Center, 5520 Lacy Road. The author is Jeff Hagen. He has written several popular books such as Hiawatha Passing which is a picture book about the train called the Hiawatha which traveled between Chicago and Minneapolis via Milwaukee. He has also authored several books about food traditions and restaurants in Wisconsin such as, Searching for the Holy Grill and Fry Me to the Moon. This evening is for all ages. Children are encouraged to attend. HospiceCare Inc. will hold one more free question-and-answer seminar in April. “Making the Hospice Choice” will be held on Thursday, April 15, from 9:00 a.m. to 10:30 a.m. The seminar is free, open to the public and will be held at the Don & Marilyn Anderson HospiceCare Center, 5395 E. Cheryl Parkway, in Madison. Pre-registration is requested; please call Carrie Glantz, HospiceCare public affairs, at (608) 327-7202. In April, HospiceCare Inc. will offer three recurring support groups for those grieving the death of a loved one. HospiceCare will also offer an informational seminar for caregivers. All groups are open to the public and free of charge. All groups require pre-registration and are held at the Don & Marilyn Anderson HospiceCare Center, 5395 E. Cheryl Parkway, Madison, unless otherwise noted. · Bridges Weekly Support Group is held every Wednesday, from 9:30 a.m. to 11:00 a.m.
· Introduction to Grief is held the first Wednesday of every month, from 6:30 p.m. to 7:30 p.m.
· Young Widows Group Is held the first Thursday of every month, from 7:00 p.m. to 9:00 p.m., at San Damiano’s, 4123 Monona Drive in Madison. · Understanding the Dying Process will be held Tuesday, April 20, from 6:30 p.m. to 8:00 p.m. This seminar is for those caring for someone with a progressive or terminal illness. It’s all about the Chili Fest: one “poster” and one article! Please bring your famous chili! Top chilis will win a prize!! Drawings for door prizes too. There will be arts and crafts for kids as well as games and socializing for the adults. Join us to meet our neighbors!! It’s FREE. It’s FUN. 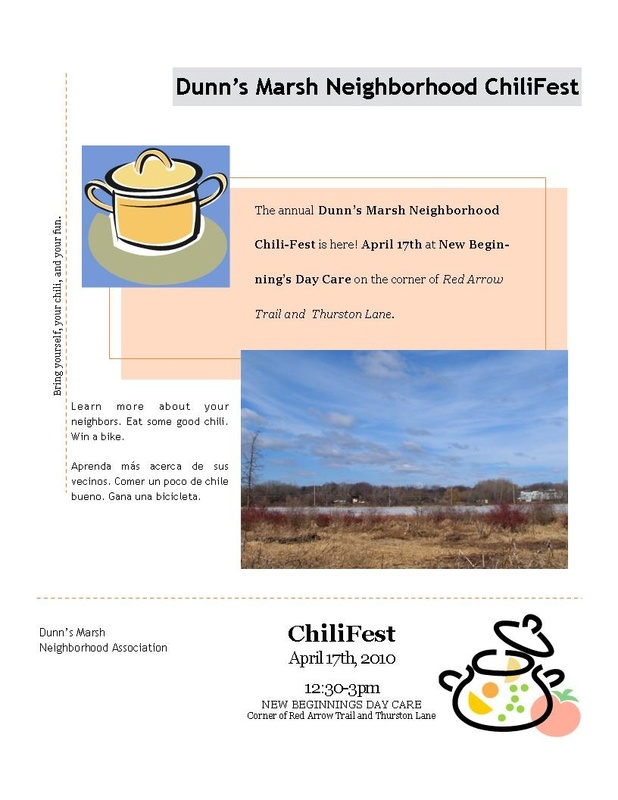 Neighborhood Chili Fest This Saturday, 12:30 – 3:00 p.m.
Come one, come all to the Dunn’s Marsh Neighborhood Association’s annual Chili Fest this Saturday, April 17, 12:30 until 3:00 p.m. This year the Fest will be held at New Beginnings Preschool, 2095 Red Arrow Trail, just behind MacDonald’s. It’s a “potluck” festival, and even better, it’s free! A chance to visit with neighbors, both long-time friends or people you meet for the first time at the Fest. Everyone from the neighborhood is invited: single people and couples of any kind, families with or without (You define your family), grandparents or retirees, long-time residents, people who just moved here, whatever your ethnic or racial background. The neighborhood boundaries are Beltline on the north, Seminole Highway on the east, Dunn’s Marsh on the south, Allied/Carling Drive on the west, Verona Road on the northwest. A chance to taste and fill up on some great homemade chilis. Please bring your favorite chili whether it is an old family recipe or something you are just trying from the Internet. If you can’t bring a chili, feel free to bring a chili condiment (crackers, cornbread, cheese, yogurt or sour cream) or a dessert to share. A chance for your kids to have fun with other kids from the neighborhood. Arts and crafts are on the agenda. Board games will also be available, and for the little ones, if it’s a nice day, the outdoor play area will be available. This is a family affair. Bring your kids with you. If you prefer to play a board game or cards while you visit, some games will be available, or better yet, bring your own and recruit some of the neighbors to join you in a game. Drawings for prizes. Everyone who comes gets entered for the drawing for prizes. Some are quite substantial. Some of the prizes are a bike from Dream Bikes, a free month of exercise at Curves (2), $5 “Klinke dollar” certificates for money off your dry-cleaning bill (5), a $25 gift card from Mallatt Pharmacy, and a $10 gift certificate from MadCat on Monroe Street. There will be more prizes. So… come to the Chili Fest this Saturday at 12:30 . Bring your chili. Bring your partner or spouse. Bring your neighbors and friends. Bring your kids. Let’s all have a good time. Mary is out of town on vacation, so I thought I'd send some updates on what's going on in our neighborhood. For those who don't know me, I'm Jeff Glazer, President of your Dunn's Marsh Neighborhood Association. As you can tell by the flurry of emails sent by Mary in the past few months, we've been hard at work in the neighborhood. With the onset of Spring, there will come a new slew of projects to undertake and I hope this email will address some of those. But, please, if you have any questions, concerns or comments, please get a hold of me. You all now have my email address (jglazer75@gmail.com) and my phone number is 608-277-1778. I'd love to hear from you. So, now, on to the good stuff. Dunn's Marsh is on Facebook! 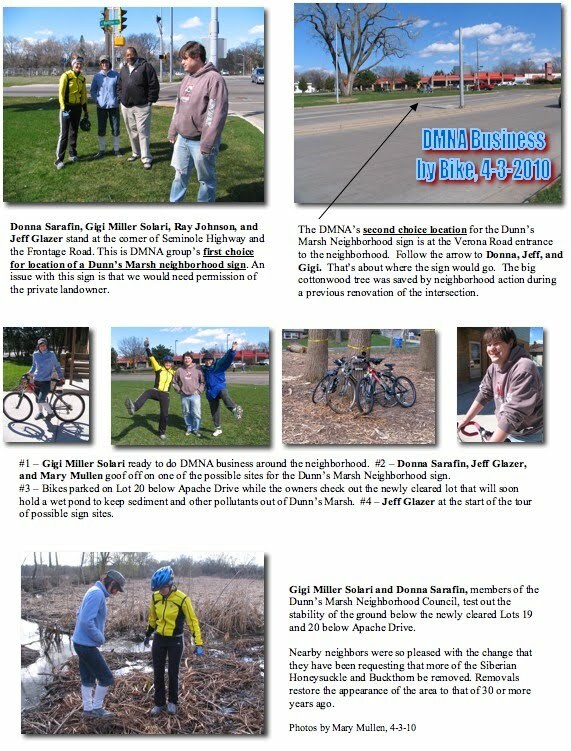 Become a fan at: http://www.facebook.com/pages/Dunns-Marsh-Neighborhood-Association/187654193505?ref=ts - you'll get this e-newsletter to your Facebook account and put a face to your neighbors. We also occasionally post photos and have discussion groups for you to get a hold of the Neighborhood Association Council or each other. The ChiliFest will be held on Saturday, April 17th. New Beginnings DayCare, with new management and a nice, big, fun space, have generously agreed to let us use their space. So, bring your Chili, your kids, your friends, your dog, your bike, whatever. Just get yourself over there and enjoy an afternoon of mingling with your neighbors. We'll have door prizes and maybe a surprise or two for you. A time has not yet been selected, so please keep an eye out. historic leadership role in environmental thought and policy, and help chart our path to a sustainable future. As you'll recall, our neighborhood is registered for the MGE Green Power Challenge. We have an excellent opportunity to win some cash for our neighborhood, and help save the environment all in one go. If you have not yet signed up for MGE's Green Power initiatives, please do so. My wife and I have enrolled, our energy use is completely set-off by wind-power purchases to the grid, and our energy bill went up by less than $5 per month. Knowing that your energy comes from sustainable sources and that you are not contributing to further coal emissions is worth less than $5 month, no? Madison Gas and Electric has developed a new web page and map at http://www.mge.com/challenge to help update neighborhood residents about the green power challenge. All 16 participating neighborhoods are located on the map along with links to the respective neighborhood web sites. In May we will check on green power participation in each neighborhood and show the percent changes on the page. As we head in to April and Earth Day, you can use this page to inform your neighbors about the challenge. From there they will be able to link directly to the MGE green power information and sign up form. Thanks again for your participation and your support for renewable energy. Please let me know if you have any questions or would like any resources to help with the challenge. You'll recall that our neighborhood has been awarded the grant opportunity to win a fruit and nut orchard to be planted in Marlborough Park. This orchard will be freely accessible to anyone in the neighborhood. We'll have educational events on what to do with these fruits and/or nuts. And, it will be provide food access and education for our neighborhood for years to come. This is a once in a lifetime opportunity for us to do what's right for ourselves and our children and our neighborhood. But, we won't get this orchard unless you vote for us. So, go to http://www.communitiestakeroot.com/Plant/Index, find Madison: Allied Wellness Center (that's us! ), and vote. You can, and should, vote every single day. Once a month between now and September, the top 5 neighborhoods will win an orchard. So, please, help us out and vote. contact Rick at 270-4264 or rick.eilertson@city.fitchburg.wi.us. There is a meeting coming up next week of the Policy Advisory Committee ("PAC") and Technical Advisory Committee ("TAC") for the Verona Road construction project. The public is welcome to attend this meeting, but non-committee members may not (and probably will not) be permitted to comment. I, and a few others, plan to attend this meeting and will report back to you. If you would like to attend this meeting, I ask that you do so in a friendly and open manner and that you follow the rules established for the meeting. We will be holding a joint PAC/TAC meeting on April 7th, from 6 P.M. to 8 P.M. at Strand Associates, 910 W. Wingra Drive. This will be the last meeting before the release of the SDEIS and public hearing. The SDEIS describes WisDOT's three-stage preferred alternative. The public will have 45 days to comment on the SDEIS once it is published. The hearing is a public event where anyone interested can learn about the proposal and comment if desired. This meeting will provide background on both the document and the hearing. You are encouraged to attend or send an representative if you are unable to.